My main practice involves painting with oils on canvas, linen and board. I start with a basic study of a composition idea, take it further as a small watercolour painting as a final idea and then develop it more as the finished oil painting. I also use photographs to create a visual reality that can be convincing at times and especially if I want to get the likeness of a person’s face. It has also been good for me in the fact that it has taught me to use observational skills a lot. A lot of what I now paint is something that I have mainly taught myself. I enjoy painting a lot because it gives the imagery more colour and character as well as being hands on. The historical influences in my work arise from Surrealism and fantasy art. Hieronymus Bosch, Pieter Brueghel, Rene Magritte and M. C. Escher are also influential. With Escher, metamorphosis is a recurring theme as it is with Salvador Dali and this drew me to their work. My painting practice started when research into Hieronymus Bosch and Salvador Dali took place. My own contemporary concerns have included people and more recently, cityscapes that are often warped to create an impossible reality. I also look at fantasy artists such as Wayne Barlowe, Jim Burns and Stephen Youll. 2014 Passion Pallette, Art show, Gallery Chi Chi, Bow, London 20 water colours. 2014 Hidden Treasure, Book publication 2015 Artwork chosen. 2012 ArtistsMeet Open Exhibition Rickmansworth. 2012 Children of Peace Charity Event. The Gallery in Cork Street. 2011 Children of Peace Charity Event. The Gallery in Cork Street. 2010 The Landmark Arts Centre A two month show. 2009 The West Eleven Gallery, Covent Garden Art Addict Show. 2009 The Menier Gallery United Society of Artists show. 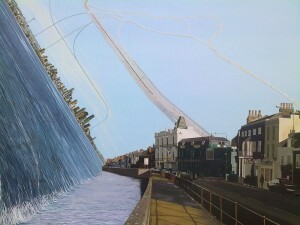 2009 Art of Imagination show in Isle of Wight A work shown with other artists. One work shown for a month. Art show as a group. 2008 EWACC Exhibition in Japan Art show with artists all over the world. One work shown for six weeks.